The Spina Bifida statistics for Alabama are as follows: Out of 10,000 births, about 3.04 babies were affected with this condition in the state. Cases of SB occurring in infants in the state of Alabama are increasing significantly. These results are according to data collected in Alabama during the period of 2001 – 2005. Current data indicate that the birth rate of babies affected with this health problem, post 2005 have increased. Today 1,417 people with this health issue are residing in Alabama. Around 3% out of the population in the state of Alabama are of Hispanic/Latin origin, which are at higher risk of delivering babies with this disease. There are many clinics and support groups in Alabama to help people affected with this condition. One clinic is located in Mobile which provides treatment for patients with this condition. There are two clinics present in Birmingham. At the University of Alabama, Birmingham there is a patient registry clinic where patients can get their names registered. Also there are three organizations that provide extracurricular activities for children. 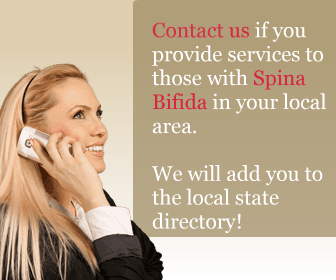 The Spina Bifida Association of Alabama provides resources and support services in the state.